Despite being such a great Philosopher, Thinker, Poet, Orator and Laureate, Acharya Mahapragya has given us a new definition of the word ‘devotion’. He was completely devoted to his Guru, Acharya Shri Tulsi. Acharya Tulsi was the 9th Acharya of the Terapanth Sect and had sponsored the Anuvrat Movement. He is a well known world figure, who was adorned with a number of awards, titles and epithets by many national level institutions. He has laid down the basic code of conduct for a Normal Man to lead a Peaceful and Purposeful Life.Acharya Tulsi’s vision and dreams were all fulfilled by Acharya Mahapragya. It was Acharya Tulsi’s direction that lead to Acharya Mahapragya’s action. The rapport between both of these Acharyas was extraordinary. They seem to be two-in-one in form and in spirit.Acharya Mahapragya has made sure that all Acharya Tulsi’s dreams come true.It can be said that the Concepts were Acharya Tulsi’s and the implementations would always be done by Acharya Mahapragya. 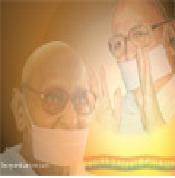 Acharya Mahapragya became Acharya in the presence of Acharya Tulsi himself. Acharya Tulsi gave up Acharyaship and made Yuvacharya Mahapragya the Acharya. This happened for the first time in the history that during the life time of one Acharya, the Yuvacharya was made as the Acharya and the sitting Acharya relinquished the Chair. The height of devotion and oneness between Acharya Tulsi and Acharya Mahapragya can be clearly seen from this episode. Even after becoming Acharya, his devotion did not decline. Such simplicity and sobriety are hard to find in any personality. His devotion showed not only in his actions, but in his thoughts and words too.